When it comes to enjoying our holidays, food and dining out play a pretty big role, don’t you think? That’s partly because eating out can be more practical, but it’s also a treat, and that’s what vacations are all about. For many travellers these days, the local dining scene can also dictate the holiday location. We are becoming a nation of foodies and, when we go on vacation, we can really indulge ourselves. As a result we have seen the emergence of many food-related tourist activities, including Farmers Markets, cellar doors, food and wine trails, food festivals and degustation dinners. One of the best holiday destinations in Australia for indulging this passion is the Gold Coast, offering a huge selection of international cuisine, as well as traditional beachside fare, and the fresh farm delights of the hinterland. 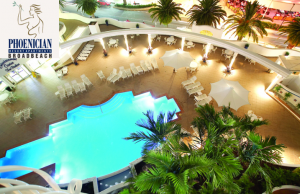 There are some very good restaurants on the Gold Coast, many of them located on the famous dining strip at Broadbeach, within walking distance of the Phoenician Resort. In fact, you could say that this proximity to delicious flavours from around the world is one of the main attractions of booking accommodation at the Phoenician Resort. What’s more, the resort is also close to Jupiter’s Casino, which boasts no less than four gourmet restaurants, as well as world class shows and entertainment. For those who love to do their own thing when it comes to food, self-contained holiday apartments are perfect. They offer the freedom of wandering out for breakfast, lunch or dinner whenever you wish. The gorgeous one and two-bedroom, air-conditioned apartments at the Phoenician Resort have an added advantage, too. Namely fully equipped kitchens. That provides even more dining flexibility, especially for those travelling with children. A favourite activity of mine when on the Gold Coast is to spend the day in the wonderfully lush hinterland, exploring the picturesque villages and rainforests, stopping off at the local farm gates and wineries to stock up on goodies. Then it’s back my private balcony at the resort for a gourmet picnic. Bliss! Of course, the great kitchens with their European appliances are just one of the many great facilities at the Phoenician Resort. There are also sumptuous queen beds, luxury bathrooms, spacious living areas, Austar, your own washer and dryer, even security entry. And all for such good prices. Actually, when you consider the amenities at this resort, it is hard to believe they can offer such great deals! For starters, there are indoor and outdoor swimming pools, not to mention the spas, sauna, gymnasium, games room, barbecues, tour desk, and secure undercover parking. You’d enjoy all that at the best of times, but when you can also get a great deal on the price, it seems even better, and leaves plenty left over for all that dining out! If you’d like to sample those wonderful restaurants on the Gold Coast for yourself, it’s probably time to check out some of the great accommodation deals at the Phoenician Resort. It’s easy – just go to www.phoenician.com.au and click on Specials.